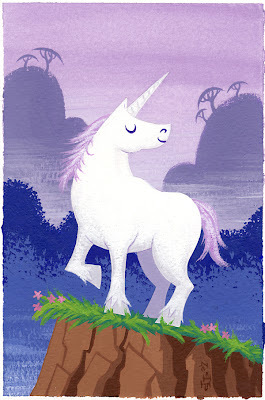 This one is just for me, because I love unicorns. They're so magical! Their horns are said to cure poison, and kill their natural enemy in the wild, sharks. It's actually for my niece Alyssa, who will be four in January. 4" x 6" cel vinyl acrylic on watercolor paper, as usual. All the kiddies are taken care of for Christmas! Now for their parents. Very nice dude! Just like the others. Your color schemes are dead on. And in case I didn't say it already (I think I did) have a merry Xmas!